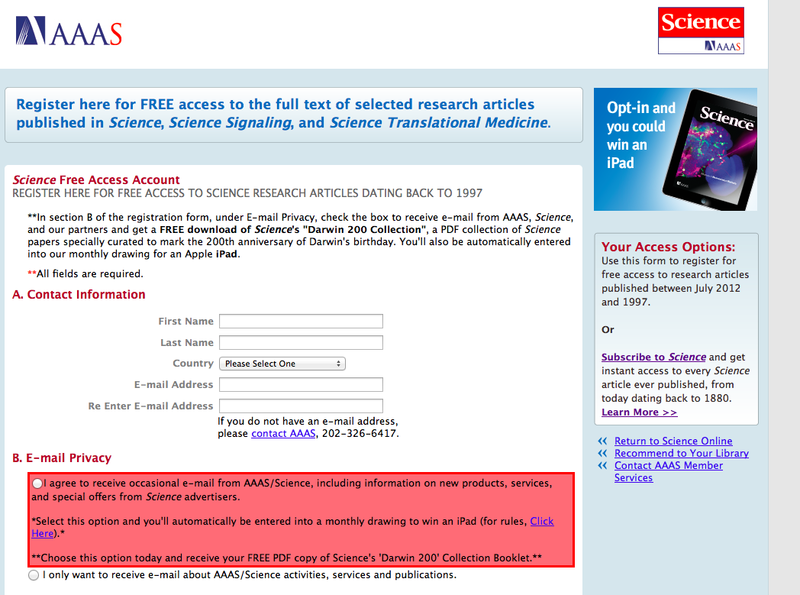 The Tree of Life: AAAS - Blocking Access to the Scientific Literature Even When They Say It Is "Free"
Today, I wanted to show someone a PDF of a paper of mine that I co-authored in 1999. The paper was, I think, kind of cool. It reported the sequencing and analysis of the genome of Deinococcus radiodurans, an incredibly radiation resistant bacterium. Alas, I did not have a copy on me, and the only electornic device I had with me was my phone. The person I wanted to show the paper to had their computer, a device with a strange little red trackball and running some sort of Windows operating system, so I looked at it and panicked and said "Maybe you should drive" (as in, maybe they should be the one controlling the computer). So this person, who shall remain anonymous mostly because of the ancientness of their computer, did the kind of obvious thing, and opened a web browser (don't even ask which one) and typed in "Pubmed.Com". OK - that would work. 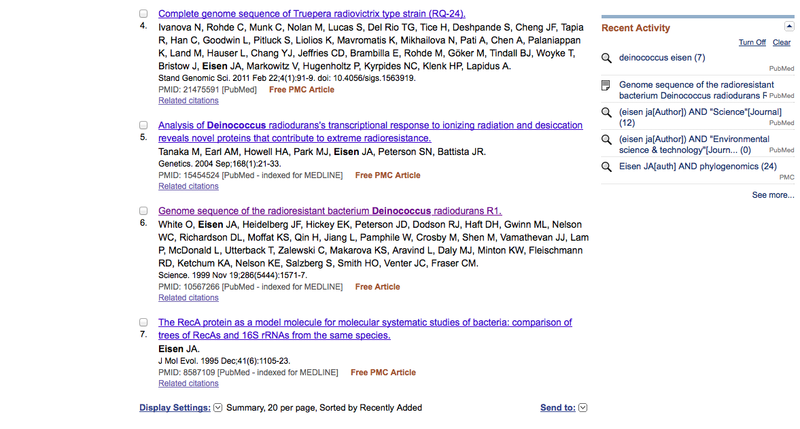 I might have preferred going to Google Scholar, but I use Pubmed about as frequently. And though I do not have a Windows machine or the weird web broswser they used, I have recreated what happened next. A nice Pubmed window. And I said, type in "Deinococcus Eisen." and seven papers showed up. And so I said "Scroll Down" and "Near the Bottom" and there was the paper "White et al" from 1999. 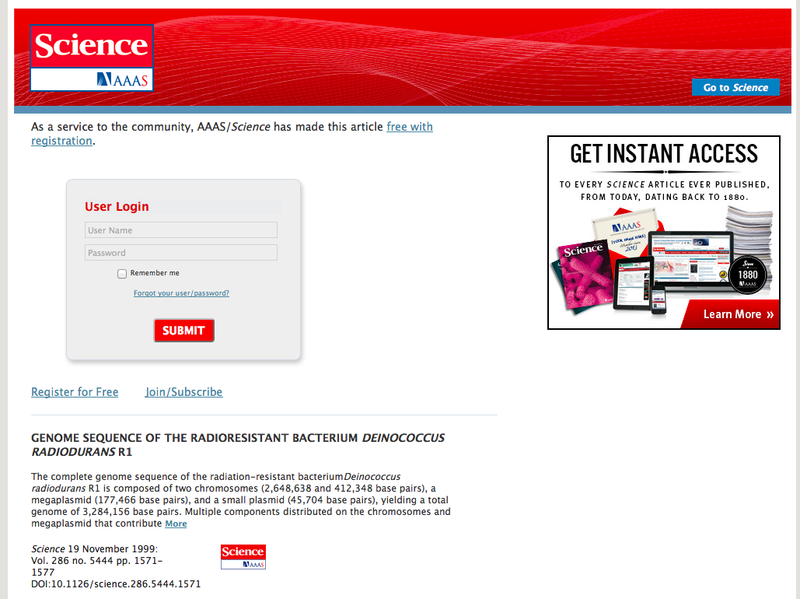 I was happy to see it said "Free Article" since I could not remember if AAAS had made this article available or not. So I said "Click on that one". And we looked around for a minute and at the same time we both realized, there in the upper right corner was a link to Science "Full text". 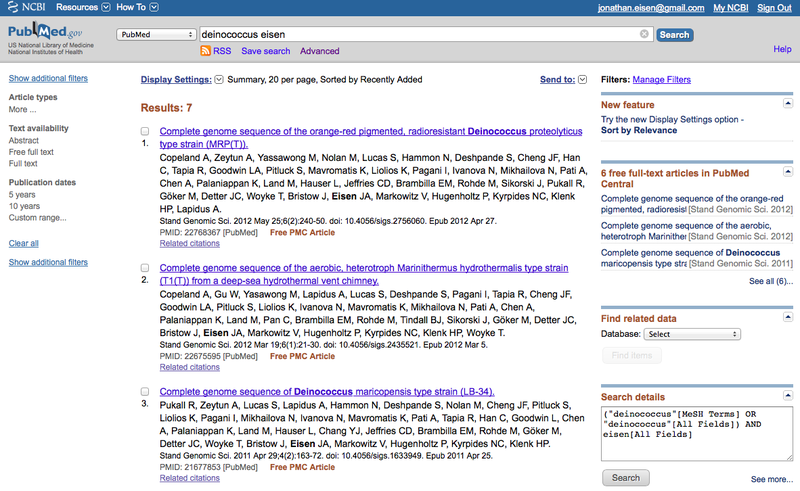 And I thought - cool - the text is available just at Science not at Pubmed. And my colleague clicked on this. The information collected may be used by AAAS for the purpose of operating and improving the Science Website, fostering a positive user experience, and delivering the products and services that we offer. We may also use the information we gather to inform you of other products or services available from the Science Website or to contact you about your opinion of current products and services or potential new products and services that may be offered. We may use your contact information in order to send you e-mail, postal mail, or other communications regarding updates at the Science Website, such as Job Alerts, newsletters, new opportunities, and additional listings which may be of interest to you. We may also use it to send you information about third-party products and services that match your interests and preferences, if you opt in for this communication. We do not release any of your contact information to third parties unless we have your permission. The nature and frequency of these messages will vary depending upon the information we have about you. 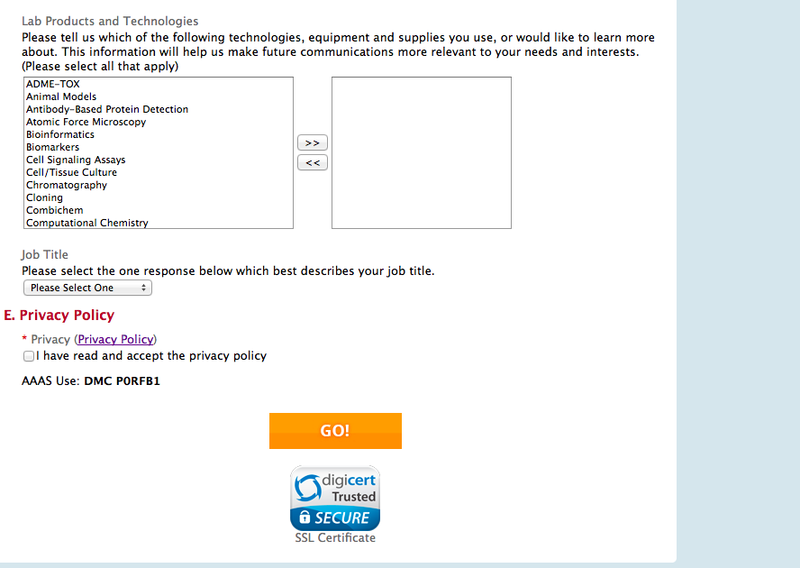 In addition, at the time of registration for certain services, such as Science Careers Job Alerts, or free partial access to any of the Science websites, you have the option to elect to receive additional communications, information, newsletters, and promotions relating to topics that may be of special interest to you. We may share information, such as your IP address, with third parties as might be required for technical purposes, such as facilitating user discovery and access via web search engines. 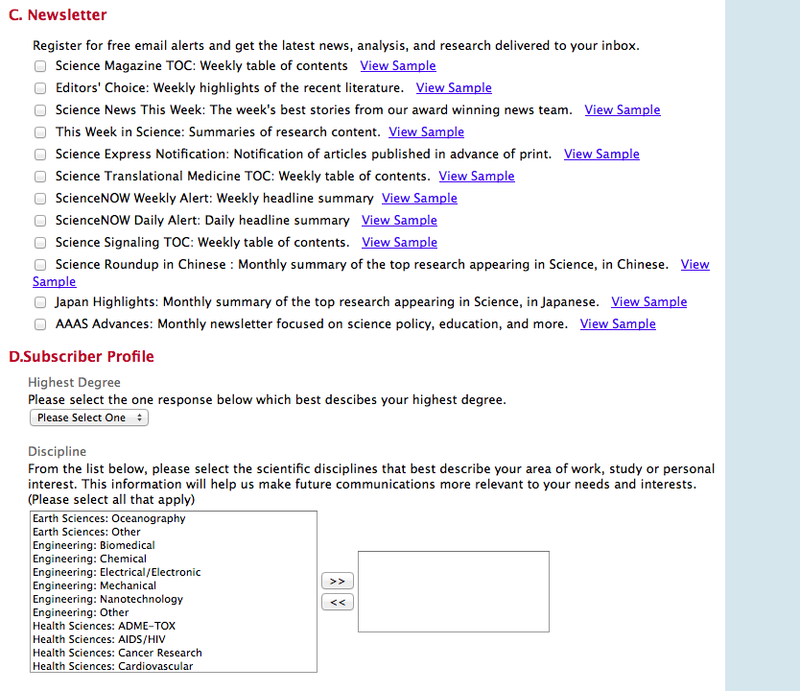 Users of free online services provided by AAAS±such as free partial access to Science, Science Signaling, or Science Translational Medicine, access to ScienceNOW or SAGE KE, e-mail alerting services or Science Careers services±are agreeing that AAAS may contact them by e-mail in exchange for these free services. Users can also opt in for third-party informational e-mails. 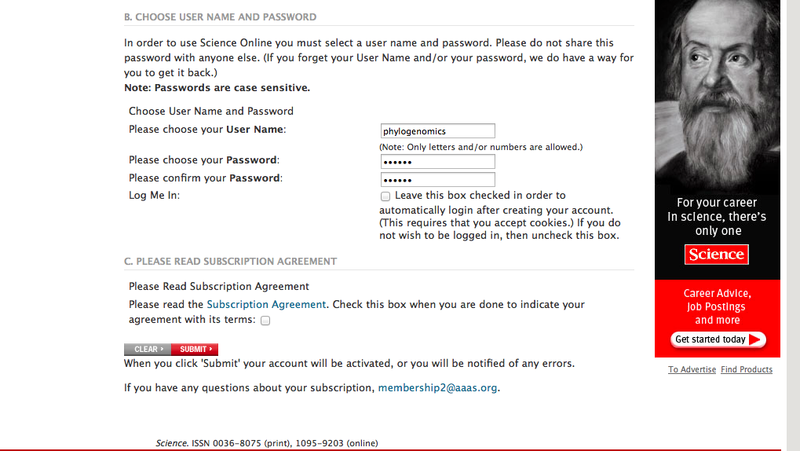 Users who do not wish to receive e-mail may cancel their online services by following the unsubscribe instructions at the bottom of any e-mail message from AAAS. Although there is no charge for the use of some portions of the materials contained on the Science websites ("Websites"), all the materials are protected under copyright and other laws of the United States, and, under international conventions, similar laws abroad. Please respect the copyrights and related rights of the authors and publishers of the Websites. The contents of the Websites as available through the Free Service, may only be accessed, viewed or otherwise used by a Registered User. A Registered User is permitted to view, browse and/or download for temporary copying purposes only the contents of the Websites, provided these uses are for noncommercial personal purposes, and further provided that the Registered User maintains all copyright and any other notices, on all copies. Registered Users are not, however, permitted to store in electronic or any other form, any significant portion of the Websites. Except as provided by law or by this Agreement, the contents of the Websites may not be further reproduced, distributed, transmitted, modified, adapted, performed, displayed (including adaptations/displays such as by "framing"), published or sold in whole or in part, without the prior written permission from AAAS. Any use which is commercial and/or non-personal is strictly prohibited, and may subject the Registered User making such uses to immediate revocation of access to this Free Service, as well as any other applicable civil or criminal penalties. Similarly, sharing a Registered User password with a non-Registered User or otherwise making this Free Service available to third parties is strictly prohibited, and may subject the Registered User participating in such activities to immediate revocation of access to this Free Service; and, the Registered User and any third party, to any other applicable civil or criminal penalties. In the case of an authorized site license, a Registered User shall cause any employee, agent or other third party which the Registered User allows to use the Free Service materials to abide by all of the terms and conditions of this Agreement. In all other cases, only the Registered User is permitted to access the Free Service materials. Well, this is getting pretty complicated and there was a lot of other stuff there. But I checked the box. I felt even ickier with this one and thought I really should consult a lawyer. But I did not. And I submitted this form. And finally I had it. It took about an hour. This may seem minor to many out there but it seems inappropriate to me. This paper represented hundreds of thousands if not millions of dollars of work funded by the Department of Energy and was published in 1999. The goal of the work was to share knowledge. And this is a major roadblock to sharing that knowledge. Plus, all the restrictions on use and reuse mean that anyone wanting to share the knowledge with others also is restricted. The agreements imply that I should not use anything from the paper in a talk or a class or in any way. There is no mention of Fair Use or any other hint that it would be OK to share the material for educational or scholarly purposes. And who knows what crap I am going to get sent to the email address I used for this registration. So - why are there all these restrictions? I presume, to make AAAS money in some way. Is that a bad thing? Well, in principle I am all for publishers making money. I subscribe to many newspapers. I subscribe to many magazines. I buy lots and lots of books. I pay for music and movies and other works. I don't download anything illegally. So why not just accept that people should pay for scientific papers? Well, because this paper, and 1000s and 1000s of others are different than all the other works I list above. Owen White and I (with some help from some others) wrote this paper. AAAS and Science did little except handle the peer review and do some copy editing. They just simply do not deserve the rights they are claiming to this article and to all the others. And as a society supposedly for the "advancement of science" it seemed to me that they should make it easier to access the old literature. They could certainly make all papers published more than 12 months ago freely and openly available and deposit them in Pubmed Central. It would be incredible beneficial to science and to scientists. But they do not. Is this in the interest of the "advancement of science"? Unquestionably no. But I guess they have decided it is in the interest of the "advancement of Science" where the journal and money for the society is the goal and the advancement of science is lost in the ether. In the end, I deeply regret having ever published in Science. 15 years after publishing this paper I would definitely say it would have been better to have published in another journal - one that makes papers more openly and freely available. I cannot change the past. But I will not support AAAS or its activities in the present or the future unless they change policies and practices. I think there is 0 chance AAAS would share that information. They seem to have no interest in expanding their sharing of scientific knowledge. What a stupid policy. 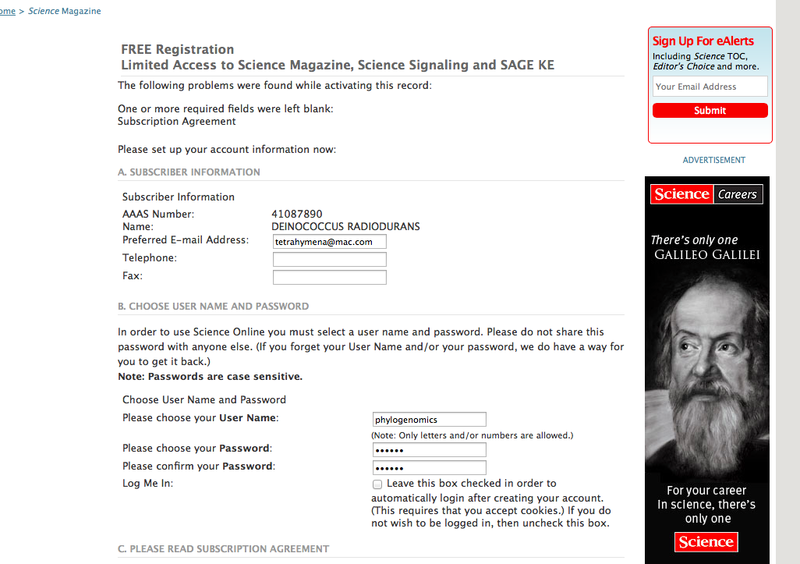 AAAS keeps sending me free issues of Science to entice me to join. I haven't yet, and after reading this article, I'm less inclined to join. Next time this happens, I strongly recommend going to http://libgen.org/ and searching on the DOI - very likely they'll have it there, completely free to download. "They could certainly make all papers published more than 12 months ago freely and openly available and deposit them in Pubmed Central." Ha! Ha! Funny! Given that Science just made commercial journal profiteer Kent Anderson their new head publisher, and Kent hates PubMed Central with a passion, that's about as likely as hell freezing over. He's planning to launch AAAS' PLOS ONE clone which he'll probably use as "evidence" that AAAS supports open access while stopping any open access for Science itself. 1) Did not remember that I had that. 2) Alas, the reason I thought I did not have a copy on my web site was that it actualy violates the AAAS policy. They allow that for the accepted verions (as in, final authors submission). They do not allow that for the final version. Which is what that is. Ugh - thanks for highlighting this. Just wanted to give a tip for folks re: "So - I used a email address I have never used for anything else (so I can track who AAAS sells my name to)." If you have a gmail account, you can use a handy tip to filter/tag e-mail by putting "+anything" before the @. In other words, if your gmail is "myaddress@gmail.com", you could have used "myaddress+aaasBS@gmail.com", and then set a filter for anything containing "+aaasBS". Any text that's permissible in an e-mail address can go after the "+" and before the "@" will work. Everything goes to the same inbox, but then you can easily tag, filter or mark things as spam. Oh man, that's dastardly. Another trick (though not quite intuitive) is that gmail ignores periods before the @, but you can still use them to filter. So "myaddress@gmail" = "my.address@gmail" = "m.y.a.d.d.r.e.s.s@gmail". All of the +notation I've used in the past has worked, so I haven't had recourse to this trick, but it might be of use. I'm scientifically trained, but don't consider myself a "real" scientist. I once attempted to look up a scientific paper and ran into the same crap you described. Needless to say, I not only didn't put in the effort to get to the paper, I consider myself successfully isolated from ever reading one.